For serious investors in physical gold who require a high quality 99.99% pure gold bullion bar from a reputable gold refinery, the Argor-Heraeus 1 kilo gold bar is a natural choice. Argor-Heraeus, established in Switzerland in 1951, is headquartered in Mendrisio in the Swiss Canton of Ticino, Switzerland's golden triangle of precious metals refineries. The front of the 1 kilo gold bar bar is also imprinted with a stylised AH and the words MELTER ASSAYER in a rectangle. Licensed assayers (essayeurs jurés) accredited by the Swiss Central Office for Precious Metals Control work with the Argor-Heraeus refinery to ensure that gold bar output from the refinery meets strict quality standards. As one of the preeminent gold refineries in the world, Argor-Heraeus is a member of the prestigious Good Delivery Referees Panel of the London Bullion Market Association (LBMA). and a member of the ‘Swiss Association of Precious Metals Fabricators and Sellers, known as the ASFCMP. 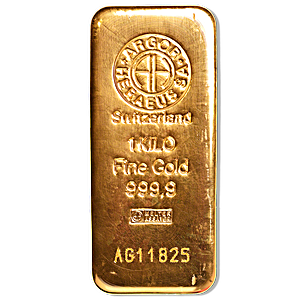 The Argor-Heraeus refinery in Mendrisio processes and refines gold, silver, platinum and palladium from mining and recyclable sources and is a specialist in refining gold into high purity investment bars, such as this 1 kilo 99.99% pure gold bar.